Today’s hike starts at the Culture & Convention Centre in Murnau. We walk southwards across the Kulturpark (Culture Park), keep to the right at the end and follow the footpath over the railway tracks and under a few mighty lime trees. Shortly before reaching the Münter House we have a splendid view of the Murnau St. Nicholas Church and the Murnau Castle (now a castle museum). Two image plates are evidence of these motifs painted by Wassily Kandinsky and Gabriele Münter, each in 1910. A stele invites us to linger. Stele 4: Münter House At the end of the footpath to our left is the Münter House, where Gabriele Münter and Wassily Kandinsky started their artistic work in Murnau late in the summer of 1908. The site and the surrounding landscape had a quite intensive influence on the development of the new, strong form of expression employed by both artists. Visiting hours: Tues.–Sun. 2–5 pm We keep to the right, walk past a few houses and arrive in an old alley of oak trees known as “Kottmüller-Allee”. Soon on the right we see a small footpath that leads over the meadow and the railway tracks. We take this path, cross the railway crossing and reach the trail known as “Eiblwiesweg”. We follow it to the right and branch off into the footpath at the end. It leads slightly uphill, and then we reach the next road and walk to the left. After House No. 9 we follow the stairs uphill to the right and reach a wonderful vantage point with several benches. Stretched out ahead of us is the Murnau Moor, framed by the Alps. We follow the path along the wall and walk downhill again, cross the road (caution: traffic!) 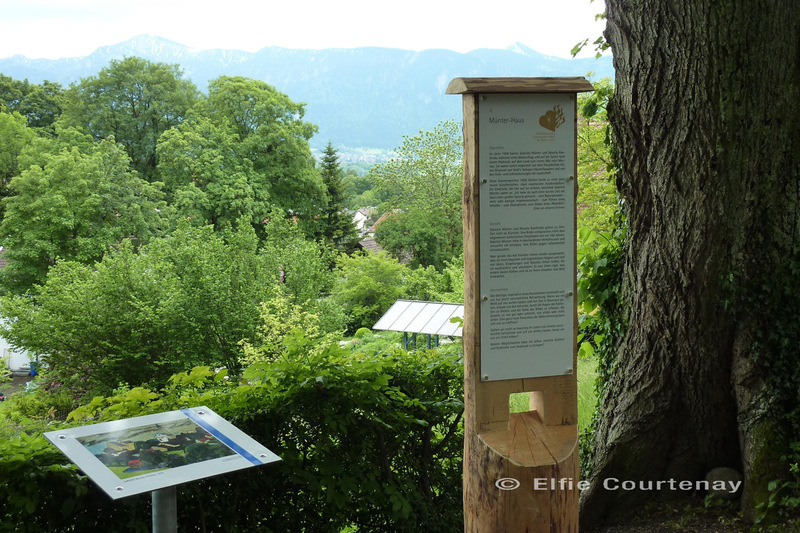 and follow the trail sign “Zum Staffelsee”. The footpath starts on the right next to the minigolf course with garden café (closed on Mondays outside the Bavarian school holidays; tel. 0 88 41/4 78 53) and Trattoria Italiana (no closing day; tel. 0 88 41/91 78; www.trattoria-italiana.de). During a little detour on the hill known as “Ludwigshöhe” we have a wonderful view of the Staffelsee with its islands and of Seehausen. The footpath leads us downhill and past several ponds to Seestraße, which we follow to the left. At the “Platzl am See” kiosk (tel. 0 88 41/48 97 48; www.platzl-am-see.de), we cross the road. The “Achele” boat pier is located in the cove behind it. Timetable: tel. 0 88 41 / 62 88 33 or at www.seehausen.net. From here we take the Staffelsee boat to the “Seerestaurant Alpenblick” pier (no closing day from May; closed on Thursdays in the winter; tel. 0 88 46/93 00; www.seerestaurant-alpenblick.de) in Uffing. We cross the parking area and follow the footpath marked “Staffelseerundweg” (“Staffelsee circular route”). We come across a narrow road, follow it to the left, reach another road and walk to the left again. We cross the road after approx. 50 metres and branch off uphill onto a footpath. We cross a narrow road, follow the footpath straight ahead and then branch off to the left on a field path. Shortly after that we reach a bench with a stele. Description from Uffing railway station Ride with the train from Murnau to Uffing. When leaving the railway station we keep to the right, cross the railway crossing and follow Bahnhofstraße towards the village centre. The road leads slightly uphill, and shortly before we have reached the hill we branch off to the left onto Jochbergstraße and follow it straight ahead. At a small roundabout we follow the field path to the left. A bank with a stele awaits us after a few metres. Stele 5: Summer holiday in Uffing Consistent tour description from here To continue we turn to the right, walk past a little playground, walk straight ahead again and thus reach Bahnhofstraße. We follow it to the left, and later in the large bend we walk straight ahead into Hechenrainerstraße. We walk a stretch straight ahead, follow the right bend, and then branch off to the left at the next fork and immediately to the left once again (dead-end road). Behind the farm to our right we follow the untarred narrow road to the right, where we reach a small footpath. This trail leads us between garden fences past a crucifix and eventually down to the River Ach. We walk further along this little river towards “Vogelmühle”. After arriving here, we cross the bridge behind the weir, and follow the “Tafertshofen Rundweg” (“Tafertshofen circular route”) straight ahead. This route meanders through the Vogelmühle agricultural estate, leads through between two meadows and branches off to the right behind a small bridge. We hike next to the River Ach, which carves it way through the picturesque terrain here. Where the footpath meets the road we keep to the left and come to the sign “Antlasgraben”, which we follow to the left. We walk uphill through a farmstead until the trail forks in the forest. Here we keep to the right, always walking along the Antlasgraben with its gently burbling water course. At the next fork we walk uphill a stretch to the left, and then again on the right further along the “Tafertshofen circular route”. 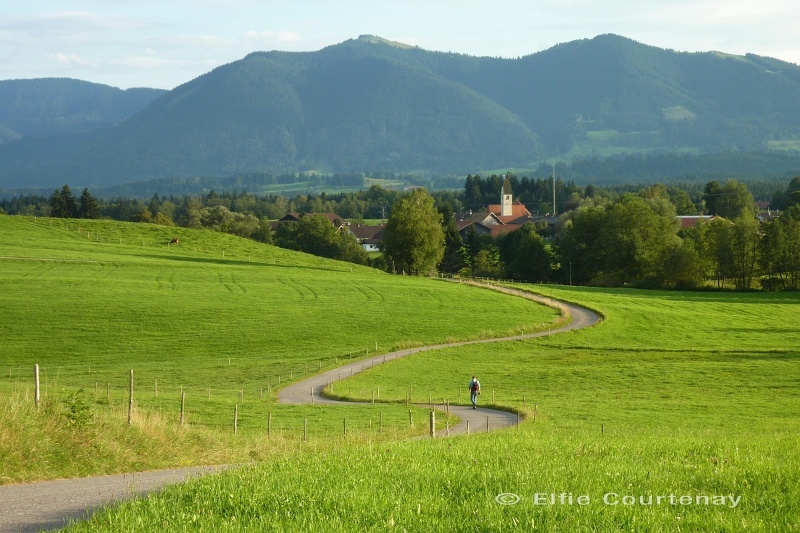 Shortly before Schöffau we come upon a tarred road, which we follow to the right in the little village. The little village shop is closed on Wednesday afternoon. Opportunity for refreshments and overnight accommodation: Gasthof Lieberwirth; tel. 0 88 46 / 6 63 (closed on Tuesday). The little St. Anna Church, a former pilgrimage church, is located at the village square. In 1552, a devastating fire raged in Schöffau, and around 1620 the church was partially rebuilt with original construction material from the 14th century. Prior to that, the island church at Staffelsee also served the citizens of Schöffau as a church over centuries. Burial mounds from the time around 1550 to 1250 BC attest to the early settlement of this village. To continue the hike we walk back again from the village square a small stretch and branch off to the left in the sharp right bend. We follow the Antlasweg trail past a few houses and a farm. We come across a narrow road, walk to the right and pass a small pond. At the sign “Uffing 6.4 km” we branch off to the right, cross the Spindler Estate, and take the middle of the three narrow roads in the direction of Uffing. It is initially tarred, and later a field path. The trail forks where the forest starts. We follow it uphill to the left and reach the Hechenrain pond, which we already see emerging ahead of us from afar. Here we keep to the right, walk on the left side of the road and follow the road to Uffing. After approx. two kilometres we arrive again at the footpath along the River Ach and thus return the way we came. Via the Vogelmühle we reach Uffing, where diverse opportunities for shopping, refreshment and overnight accommodation are available, e.g. “Gasthof zur Post” (no closing day; tel. 0 88 46 /6 91; www.post-uffing.de). 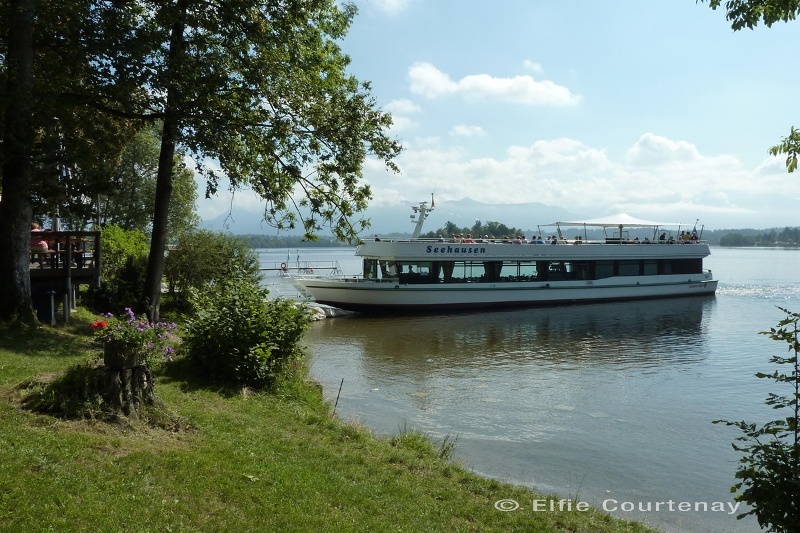 We return to the “Alpenblick” boat pier, take the Staffelsee boat and disembark in Seehausen. If we arrived by train, we return to the Uffing railway station and ride from here back to Murnau. Arriving in Seehausen, we turn to the left below the Fischerstüberl Restaurant (closed on Monday and Tuesday until Easter, Tuesdays after Easter; tel. 0 88 41 / 14 18 or 9 94 18; www.fischerstueberl-seehausen.de). We follow the footpath along the lakeshore, and after a few steps we already branch off to the right on a small path that leads us uphill to a wonderful vantage point. We let our gaze wander over the lake towards the island of Wörth, framed by the mountain chain in the background. We continue to follow the footpath on the other side. First of all we keep to the left and immediately after that to the right again. We pass the swimming beach in Seehausen and branch off to the left into the “Rosspoint”. Shortly after that, on the left-hand side we see a little gravel path that leads us to the shore of the Staffelsee and to another stele. Stele 6: Island of Wörth We linger here, immerse ourselves in the island of Wörth’s significant past and end the day at this atmospheric site. When leaving, we once again follow the path to Rosspoint, and at the swimming beach we branch off to the left onto Dorfstraße. We follow it to the left as it winds through the houses past the grocery, bakery and museum of local history. Directly in front of the Church of St. Michael we branch off to the right at “Gasthof zum Stern” (tel. 0 88 41 / 33 04; www.gasthof-stern.de;open continuously from May to September; closed on Wednesdays). We walk alongside the beer garden, cross the parking area, keep to the right and come to a fresh water Kneipp hydrotherapy basin that invites us to tread water. We follow the footpath to the left and reach Seestraße by means of a few stairs. Here we walk to the right, using the footpath next to the road. First we reach the Staffelsee swimming beach in Murnau with the “Lido am Staffelsee” restaurant (no closing day from May to October, in October only Saturdays and Sundays from midday; tel. 0 88 41 / 98 61: www.lido-murnau.de), and eventually reach the kiosk at Achele again. We walk the same way we came, then cross Seestraße and now follow the footpath on the left side that gradually leads uphill along a stream and through an old stock of trees. We come to a playground, branch off immediately to the right after that, cross the road and take the footpath that leads up uphill over a few steps. We come upon Kohlgruber Straße (caution: traffic! ), cross it, walk to the left and after a few metres turn right onto Josef-Fürst-Straße. We pass a few houses, and then this narrow road leads to a footpath. There, where the trail leads to railway tracks, we use the crossing (caution: train traffic!) and keep to the left after that. Now we are once again on the trail from where we started today’s hike. We cross the tracks once again (this time the Garmisch line, beforehand it was the Ammergau line) and have arrived at the Murnau Culture & Convention Centre shortly thereafter; opportunity for refreshments: Restaurant Auszeit (closed on Monday; tel. 0 88 41 / 48 87 90; www.restaurant-auszeit.de). Excursion tip for the summer months: with a rowboat to the island of Wörth From the Achele boat pier we pass the adjacent Staffelsee open-air beach complex in Murnau and continue to walk on the footpath next to Seestraße until the “Burgweg” trail branches off to our left. We follow this path until we come to a footpath on the right with the trail sign “Bootsverleih” (“boat rental outlet”) and “Strandbad” (“swimming beach”), in which we branch off. We stop for a moment on the wooden bridge, because from here we have a direct view of the island of Wörth, St. Simpert Chapel and the pier. We also walk across a wooden footbridge and reach the boat rental outlet to our left. Here you can rent a rowboat between April and October (but please only during stable weather conditions!). The island of Wörth is privately owned and accommodates a herd of cattle. We stay exclusively in the area of the chapel and pier! From Munich via the A95 motorway and St2062 state road as well as from Garmisch-Partenkirchen via the federal highway B.